Due process – fair access to lawyers and courts when accused of a crime – is a cornerstone of our justice system, as well as a basic human right. We all know that this right is not dependent on a person’s ability to pay; everyone has the same constitutional right to competent representation when their liberty is threatened. This idea is central to the notion that our justice system is fair to all and blind to individual differences in economic status, race, and others aspects of our identities. But we continue to ignore the national crisis happening around indigent defense. Far too many defendants are deprived of their right to fair jury representation, provided with overburdened public defenders, and hampered by structural biases in the system. In many courthouses throughout the country, defendants who lack resources either receive no representation at all, or are represented by attorneys juggling hundreds of cases. Neither scenario provides the level of representation that our Constitution requires. 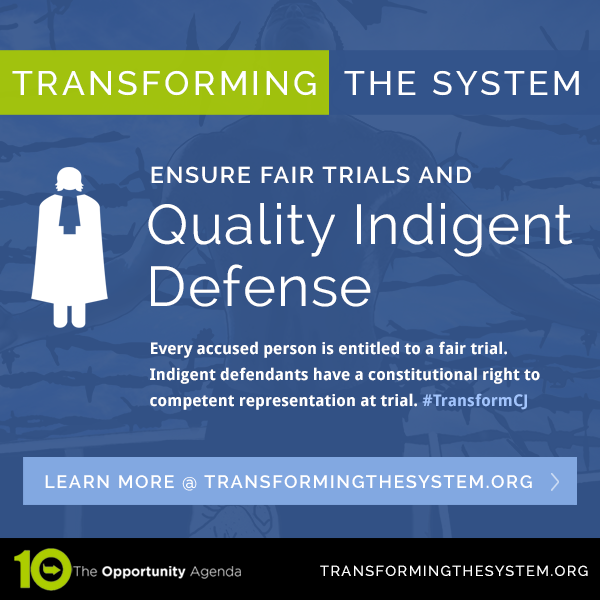 National and local bodies of government should adopt comprehensive strategies to address the indigent defense crisis in this country, both by ensuring adequate representation for all defendants and making the system easier to navigate. Congress, and local and state legislatures should pass legislation that requires a universal cap on criminal defense counsel caseloads. This will promote the provision of high quality and ethical legal services. The judiciary and local and state legislators should ensure that prior involvement in the justice system does not bar an individual's ability to participate in a jury. The majority of states have instituted life-time bars that prevent individuals who have already served their sentences from ever serving on a jury. Local bar associations and law schools should form partnerships with each other, courts, and defender attorney organizations to expand indigent defense programs. The Department of Justice (DOJ) and federal prosecutors should enforce 18 U.S.C. 243, which prohibits racially discriminatory jury selection, by investigating and filing charges against prosecutor offices that have a pattern or practice of racial discrimination in the jury selection process. Congress, and local and state legislatures should provide additional resources to increase indigent representation for misdemeanor offenses to ensure compliance with constitutional obligations. Congress should ensure that the rule banning racially discriminatory use of peremptory strikes announced in Batson v. Kentucky is be applied “retroactively to death row prisoners and others with lengthy sentences whose convictions or death sentences are the product of illegal, racially biased jury selection but whose claims have not been reviewed because they were tried before 1986." Congress, and local and state legislatures should increase the attorney compensation rate for serving on the indigent defense panel, especially for time outside the courtroom, to incentivize attorneys to allocate adequate time and preparation for these cases. The judiciary and local and state legislators should promote jury selection practices that restore party-controlled voir dire, which allows attorneys on both sides in a criminal trial to thoroughly question jurors about their relevant life experiences in order to eliminate the use of race or gender as proxies for experience. The judiciary and local and state legislators should explore alternatives to voter-based juror rolls to ensure that community members who are not on the voter rolls can nonetheless participate in juries. The judiciary should offer hardship accommodations to jurors, which include access to childcare, transportation passes, or mileage reimbursement, to ease the logistical and financial burden that low-income jurors face. Gideon’s Promise has a Law School Partnership Program, where law schools support graduates in a public defense position in the South for a year. Due process - fair access to lawyers and courts when accused of a crime - is a cornerstone of our justice system, as well as a basic human right. We all know that this right is not dependent on a person’s ability to pay; everyone has the same constitutional right to competent representation when their liberty is threatened. This idea is central to the notion that our justice system is fair to all and blind to individual differences in economic status, race, and others aspects of our identities. But we continue to ignore the national crisis happening around indigent defense. Far too many defendants are deprived of their right to fair jury representation, provided with overburdened public defenders, and hampered by structural biases in the system. In many courthouses throughout the country, defendants who lack resources either receive no representation at all, or are represented by attorneys juggling hundreds of caseloads. Neither scenario provides the level of representation that our Constitution requires. 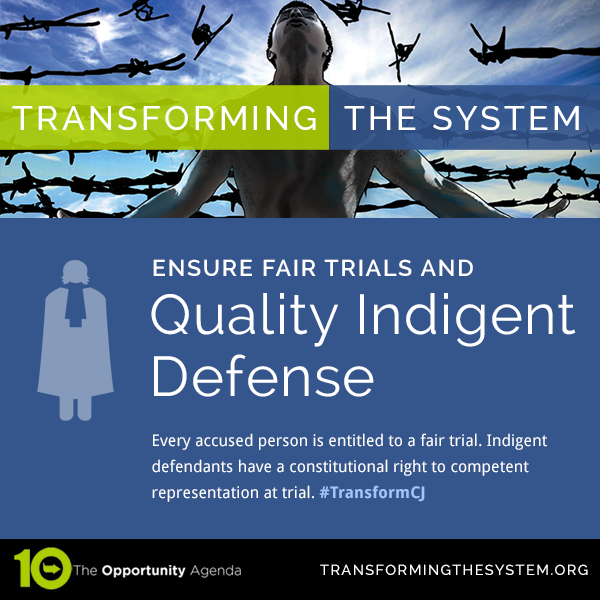 National and local bodies of government should adopt comprehensive strategies to address the indigent defense crisis in this country, both by ensuring adequate representation for all defendants and making the system easier to navigate. Urge policymakers to pass legislation that requires a universal cap on criminal defense counsel caseloads; and increases payments to attorneys on the indigent defense panel by increasing the attorney compensation rate to create incentives for attorneys to allocate adequate time and preparation for these cases.